Awakened (2018. 283 pages) is a new horror novel, written by James S. Murray and Darren Wearmouth. You know, you must take each book on its own merits, not everything has to, or should be deep and meaningful. 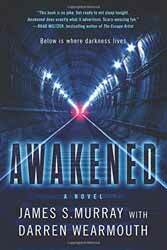 Awakened is a well-constructed monster story, but if you’re looking for character development or depth of plot then this may not be the book for you. The story splits the narrative into several POV characters, which with the short chapters allows the story to maintain its fast pace. Unfortunately, because of the relatively short nature of the book and the number of characters involved, a lot of them come over as clichéd. So, you have the Mayor whose marriage has broken down, having to fight to save his wife’s life. A President who knows more that he admits. Generally, characters behave in a gung-ho manner, reminiscent of innumerable action orientated films. One of the biggest issues the book has is a lack of originality. In the acknowledgements it is stated that the novel was originally written thirteen years ago, but in that time nearly all the ideas within this book have been seen before. The creatures come over like a more evolved version of Ridley Scott’s Alien, the whole general set up has been covered in The Strain, and the one-dimensional characters make it difficult to care what happens to them. On the plus side, the punch and pace of the book does make for an easy and enjoyable read. Taken on its own merits it provides an enjoyable, if forgettable, ride.